This was one of the mistakenly added feature around a month ago when the Blogger team did not intend to sneak it out. But now Blogger has added Star Ratings for each of your blog posts and you can use them at your blogs. 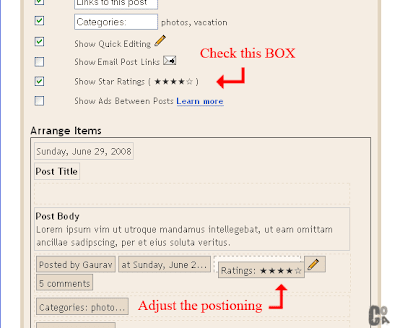 The basic reason to add this feature beneath your blog posts is to show the popularity of the post. The Installation is pretty simple for those who use the default templates of Blogger.Just follow these instructions to get it working. > Select the Show Star Rating box, and align it where you want to place it, using the arrange items preview. That was a breeze, Isn't it? But there can be a problem if you are using Custom templates, wherein the Star ratings won't show at all? But not to worry. > Perform the above steps. > Go to Layouts > Edit HTML, and expand widget templates. You have the Star Ratings enabled for your blog now. You can Rate this post too below. If you have any queries feel free to ask. Tried your hack, but it didnt work! I checked your blog, and looked to me that you haven't placed the second code properly onto your blog. I have mailed you regarding how to correct this. it doesn't work for me, i'm confused..
please get back to me on my blog, just leave a comment on any page. it would be appreciate alot. sorry, my mistake. it did work!! thank you!! the star ratings don't show on the main page, but that's because i've enabled the expandable post hack so it's fine. There is no hard and fast rule for the code to be placed. Just find data:post.body/. This depicts the Content of your Blog post. So if you place the code just after this line, Star Ratings would Appear just after the Blog Post. Nevermind :) My pleasure Ptiza. Well frankly I'm of the opinion to keep the blog as simple and plain as u can. Adding features although might look cool to you but to new visitors it looks a lot of clutter. Just be with the KISS rule and go with bare necessities. works, thanks,, note: "my template too complex"
You can't search or arrange posts based on star rating so I don't the a point in installing this. I think it kind of nice. It lets the reader give a way to leave a bad opinion without being 'sassy. It also should let you know what type of posts and comments are reaching your reader. Maybe they prefer long articles (not me) or just short usefull blurps. Anyway, if it used honestly, you can get a better idea of what 'works' or not. i hve added the code... but i havn't get the star rating.. can u plz help in this issue. Me too. My template doesnt sport the postinfo line. Great by using this feature will make our blog more efficient and effective. I will try it. Is rating is based on per ip - per posts? What is the best placement for this widget, which could make the visitor to read the content with lots of interest. Great, I will try in my blog. this is a nice add on by google. Thanks for the nice add-on. Works fine in home page. But if I open any particular blog, then in resulting page, the rating is displayed twice! > thanks for sharing..but this not work in my blog, why..? I have did all of you tell about..
Hey man, I did exactly what you said, but its not seeming to work, i'm really trying to get my blog up and running to its full potential, if you could help me out and take a look at my code that would be much appreciated, thanks. I see also that some of your posts have more than one rating. Are you manually adding it to each post? Can't find those options Layout>edit html expand widgets. Plus is there a way to customize the image instead of a star? Thanks and appreciate your help. It is difficult to implement it. The simplest method is to get the html rating code from www.ratingcode.com and paste it to rate anything on blog. not working, though I've checked star rating , but it didn't display on my blog post.